Yokozuna Hakuho has comprehensively defeated Onosho Fumiya with a beer bottle to the back of the skull on his way to victory in the Kyushu Grand Sumo Tournament. Commentators calling the bout said it was a well thought out move delivered to the right opponent. “Onosho has always been susceptible to a forceful blow to the head from a 633ml beer bottle,” announced special comments commentator Sasuga Oogesa. “The beer-bottle-to-the-head move has a high degree of difficulty, especially one that connects right on the rear end of the cranium,” added Oogesa. “Soudesune,” replied commentator Shinji Yasui. 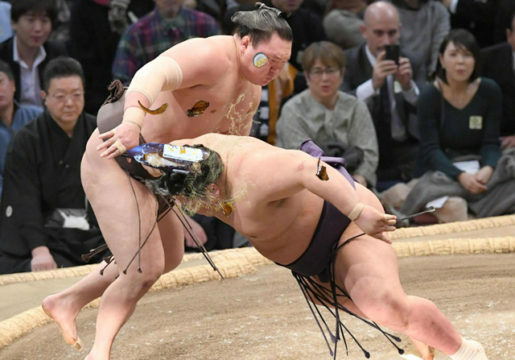 Some sumo pundits have raised doubts over the legality of the winning move, but long time stable master Hitto Eburidei told reporters the beer-bottle-to-the-head move is a well-known winning strategy amongst inner sumo circles. “Once sumo transition to senpai status it gives them the right to bully their kohai with arbitrary household items,” said Hitto Eburidei.